and once before out West. that stood in for him. A draft prose poem of sorts for With Real Toads Tuesday Open Platform. (My life still far from my own; sorry to be late with comments.) Photograph mine from a small municipal museum in Colonia, Uruguay. This entry was posted on November 11, 2015 at 7:07 am and is filed under poetry. You can subscribe via RSS 2.0 feed to this post's comments. Ooh, very spooky! And raising fascinated questions in the reader too, about the nature of ‘reality’ and many other things. Very surreal feel to this–the museum of the mind, preserving so much, and yet so unreliable! I love the way this becomes material and real, a fleshed-out fantastical episode that one can instantly relate to–drawn into the plot and subplot by the characters and how alive and real they seem, even if they, too, are the projection of an amateur godling who shaped them for a day’s exhibit–anyway, enjoyed this very much–flowed beautifully. Very spooky, but also very cool poem. Put me in mind somewhat of Casares’ short novel ‘The Invention of Morel’, but here you’ve achieved greater economy of expression. One of the things I find satisfying about your poems is that your lines aren’t arbitrary. Whether long or short, you know how to construct a line. Thank you very much, Mark. That means a lot to me coming from you. 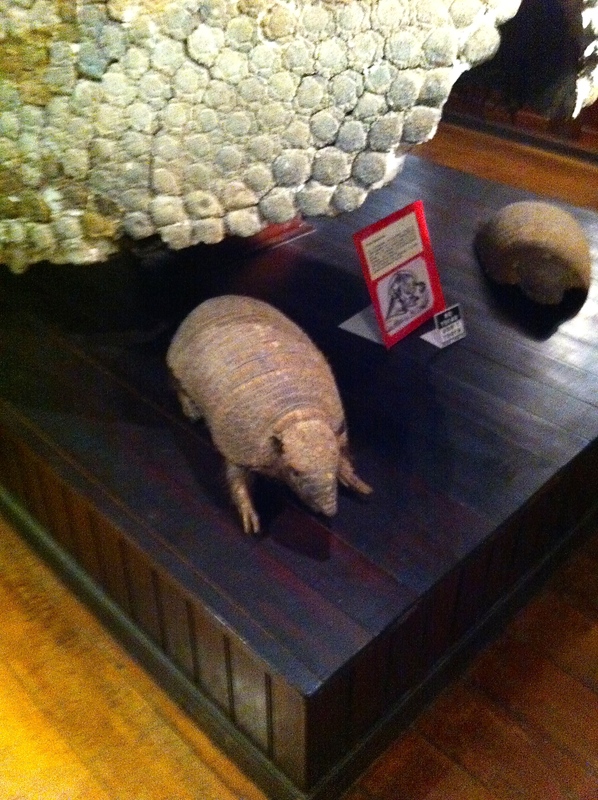 k.
A stuffed armadillo always reminds me of the novel ‘A Prayer for Owen Meany’ by John Irving. The final stanza of your poem speaks volumes to me in terms of relationships and memories. This is my kind of poem (like many others by you, I hasten to add). It takes you in different directions but the main narrative is strong: reality is deceptive. One of the reasons why I like surrealism so much is that even though Dali painted a lobster where a telephone receiver would normally go, the lobster was still telephone receiver-shaped :-). You always write such fascinating pieces. I wish I had a spoonful of your imagination. Love your ending. Ha. Well, thank you so much, Susie–I’m not so sure about my imagination, but your comment is very kind. k.
Intriguing and somewhat disturbing piece…reminds of a visit to the Buckthorne Saloon/ Museum in San Antonio…a real curiosity! So interesting! Were they ever in the west? Do they wish they had or were?